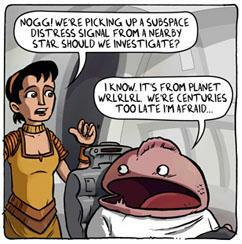 Faraday the Blob » Archive » Spacetrawler Guest Comic! Well would you look at that – I’ve got a guest strip up over at the mighty Spacetrawler today! Most of you probably know Spacetrawler already, but just in case you don’t, lemme tell ya – you’re in for a treat. It’s a long form Sci-fi epic with a great cast of characters that manages to of stuff in as many jokes and visual gags as possible while still telling an engaging story. And I love the art – as a cartoonist, browsing the ST archives can be inspirational – check out the crowd scenes here for example. I’d recommend starting from the start. So there you go – it’s not a Faraday comic, but it’s an update of sorts. Faraday should return this weekend! This entry was posted on Wednesday, May 11th, 2011 at 10:23 am and is filed under Bloblog. You can follow any responses to this entry through the RSS 2.0 feed. You can skip to the end and leave a response. Pinging is currently not allowed. Moonlighting elsewhere, eh? Great strip btw! Amazing strip over at Spacetrawler! love it. got a nice hitchhikers vibe there! Cheers JP – that’s just what I was going for (with maybe a dash of Kilgore Trout as well)!